An Englishman in Colombia: Saw-Horses! I have some work to do at my Mother in law's house, and need to take my tools between here and there, but I don't want to have to take my trailer unless it is necessary, one of the things I will need are saw-horses. 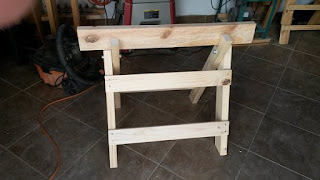 I therefore decided to make two folding saw-horses, I found the plans on woodshopdude.com, but made several changes to the design, making them smaller, but chunkier. 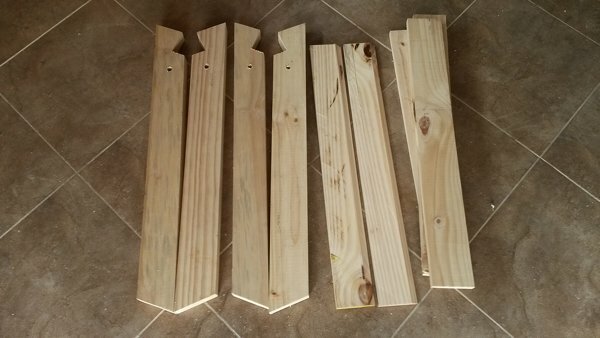 I started off by cutting the parts from 2x4, and the rails I cut down from 1x8s, all scrap left over from other projects. 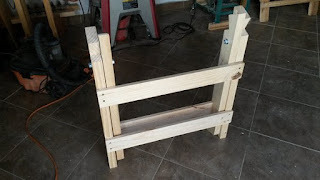 I then started assembly, I didn't have any 4" carriage bolts, so for now I have used 1/2" threaded rod, if that doesn't work out I can always change it later. 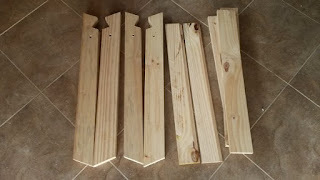 To use the saw-horse you open it up, and place a 2x4 beam, the length depending on your needs, in the cutout. Now I just have to get some rope, to hold it in position, and stop it splaying out altogether. With the top beam being removable, the saw-horse can be adapted for various uses, as I make them, I will post the details.